I hate being such a fan boy… but… Tony Hawk made my week. Via twitter, Tony Hawk is all over the map and remains a notable personality who does a great job of engaging with their fan base. At 29, I am still an engaged fan. I have always had a soft spot for skating and when I was a kid Tony Hawk was my favorite skater. Actually he’s still my favorite skater now. My biz partners give me enough grief on a regular basis about my fandom and I still get the occasional barb about “even though you built a halfpipe in the RevZilla warehouse – Tony Hawk is still not coming to skate with you. ever.” It’s comical and I always take it in stride. I think I knew the stakes going into it when I turned 29 and decided to take up a reasonably sized footprint in prime dotcom warehouse real-estate for a miniramp. I had not skated since I was 16. 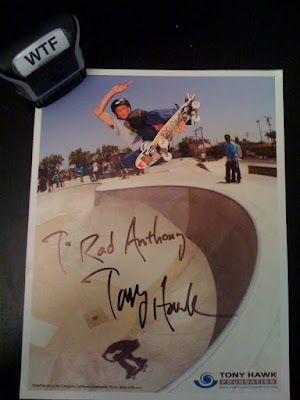 Well for some time I have seen the Tony Hawk Foundation (tonyhawkfoundation.org) raise money, with Tony as it’s obvious pitchman, for skateparks in different communities both in the US and internationally. Well a while back he called for a donation and I decided to chip in $25 bucks. I think it builds 1 square foot of concrete “obstacle” at the park to be built. The bonus prize for my generosity? An Autographed picture sent my way with whatever I wanted on it, mailed directly to me. I wanted it made out to “Rad Anthony”, and I was obliged with a full color 8×10. I spent most of my life not being rad. As I head toward 30 I am changing all that. I now have a daily reminder on my bulletin board to be rad from another rad dude. Thanks, Tony! And oh yeah, and if you ever want to donate to a good cause to “help the kids” – THF fits the bill.